Lets be frank. As bullying continues in schools and beyond, t shirt programs can bring about awareness but there has been no real change. Young people are still being bullied at school on the playground and online. Young people are dropping out of school and even worse, the trend of suicide is rising, not decreasing due to bullying. – 1 out of 4 kids are bullied. Every 7 minutes a child is bullied. – 160,000 students miss school each day due to bullying. – 86% of children report bullying has interfered with their studies. – Many kids have given up and taken their life. – Imagine if this was your friend, your brother or sister, a family member or even if this was your child. It’s time to end bullying in people’s lives. 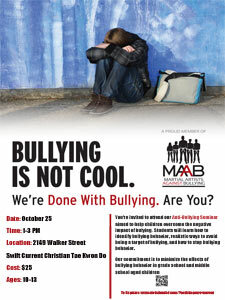 Our Anti-Bullying Seminar trains people to end bullying in their lives and in the lives of others. We believe that it is not enough to just teach our students how to defend themselves against bullying. We want to teach them how damaging bullying can be, so that they will be less inclined to bully others as well. We also want to arm them with effective strategies that they can use to come to the aid of others being bullied. A team who will stand up for themselves, their family and what they believe in. Everyone deserves to put bullying to the side and live their life.